Today was our last full day of school! I am a little sad... that might sound crazy! I didn't have a class of perfect angels this year, but it was my first class by myself, and we went through a lot together! Part of our last day was spent by us making a little snack together. 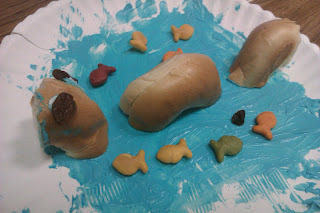 We found this recipe in the nonfiction magazine that comes with our reading program. 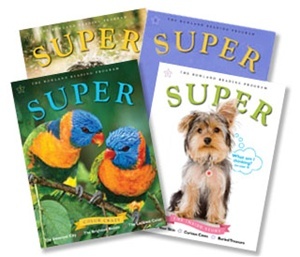 This is one thumbs-up I will give to my program... these magazines are actually pretty sweet and the kids really like them. 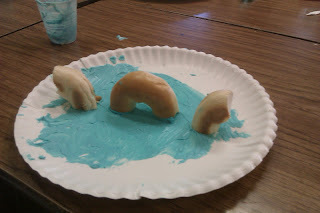 We made under the sea monster things! 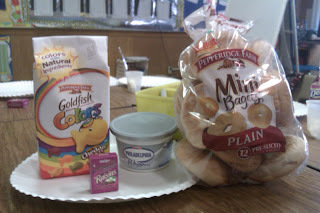 A package of Goldfish, a box of raisins per child, a tub of whipped cream cheese (one was just enough for 12 children), and one mini bagel per child! Plus a plastic spoon, knife, plate, and bowl-like dish per child. First, each kid got some cream cheese in a cup. 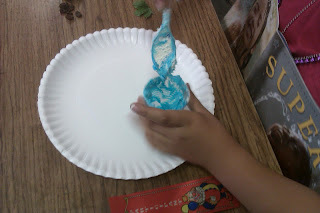 Then we added 1-2 drops of blue food coloring and stirred it up to make water! 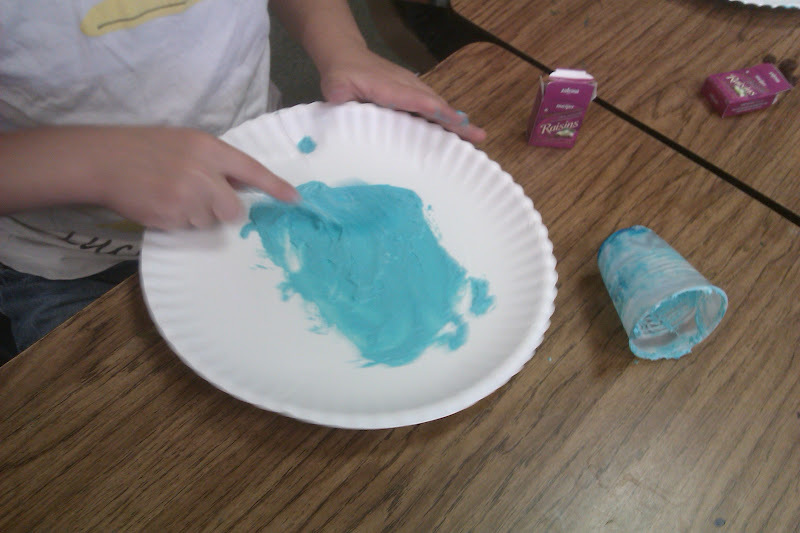 Then, we spread it onto a plate. It was really supposed to be much thicker than this (so it actually looks like flowing water), but we rolled with it. Last, use cream cheese to attach raisins for eyes, and place the goldfish wherever your heart desires. Ta da! A delicious sea monster. The kids LOVED THIS PROJECT. 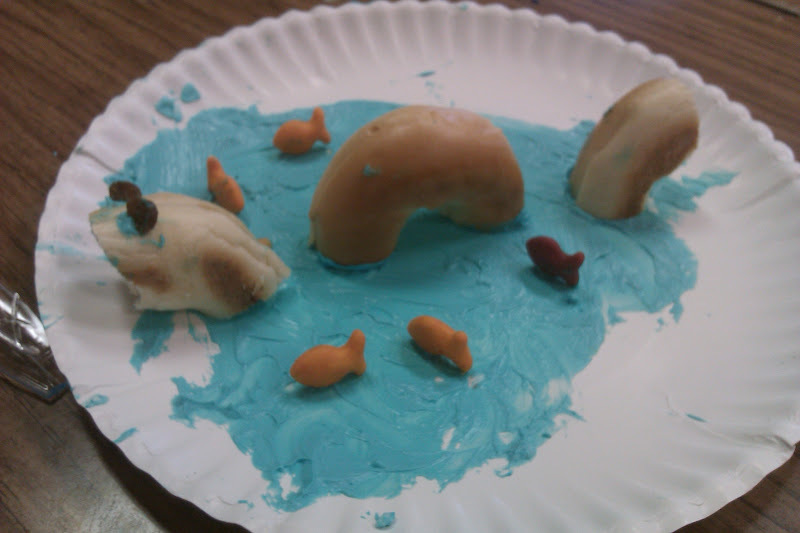 It was especially fun when they realized that the bagel is supposed to be the sea monster going in and out of the water. It just blew their minds, haha! I can't get over how cute this is!! FUN! Congrats on finishing your first year! And REALLY cute snack idea! Happy last day! This is the CUTEST snack ever! !